I hope you had a lovely weekend. I can’t tell you how excited I am about the two blog posts which I’m featuring on Flowerona today! I’ll be sharing interviews with the authors of an inspirational new book called ‘Decorate with Flowers’…Holly Becker and Leslie Shewring. I’ve admired both ladies for several years now…ever since I first got to meet them ‘virtually’ online on one of Holly’s blogging courses, where Leslie was teaching photography. And I’ve also had the pleasure of meeting them in person at book launch events in London. 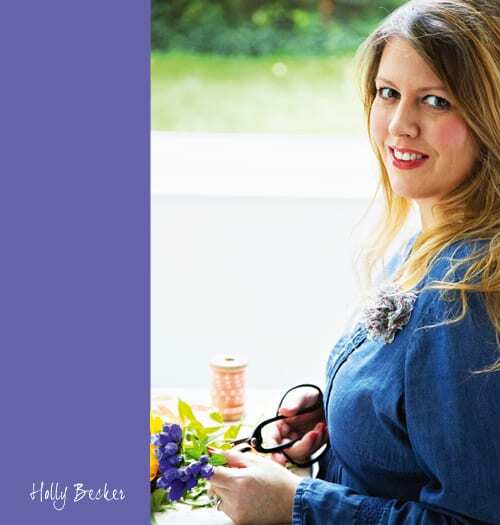 When Holly announced the topic of her third book last year, I was thrilled to hear that it was to be based on flowers! And I couldn’t wait for it to be published! Well, the waiting is almost over as it’ll be available in the UK from March 21st. In the meantime, together with Holly’s interview in this post, you’ll be able to take a peek at some of the pages from this fabulous book. 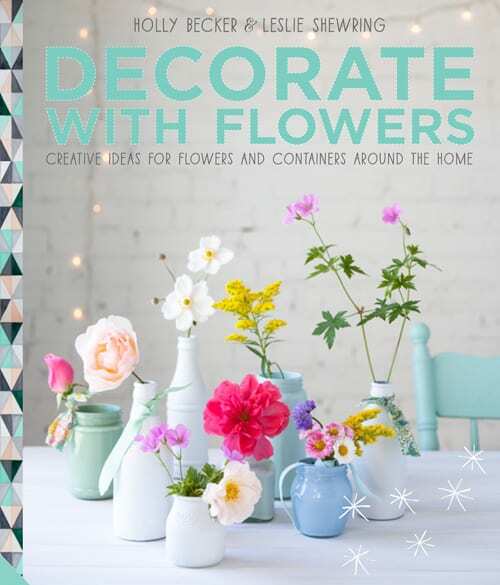 Having written two best-selling interiors books in the past, what prompted you to focus on flowers for your third book? I noticed a trend in flower books hitting the market that focused on showing how to create professional looking arrangements at home and I felt inspired by them. Yet when I tried recreating some, I realized most of the flowers had to be specially ordered, the arrangements were quite expensive once I purchased the needed blooms, and I ended up editing the arrangements so much that they looked nothing like those shown in my beautiful books — so I felt a bit deflated! Then I thought about how inspired I always was by my mother’s arrangements (she was trained as a floral designer) and also how the more natural, simpler arrangements that I make for the homes I style appeal to me, and also how much I love the floral arrangements that my friend, stylist Leslie Shewring, creates. This made me realize that how I arrange flowers makes me happy and that I don’t need to make my arrangements look more professional or perfect – that they are lovely as they are – and also that maybe lots of my friends and readers could use that encouragement too and to be told that simple, looser arrangements are perfectly fine and need not be perfect to create a gorgeous bouquet at home. Leslie, of course, felt exactly the same way and because we’re close friends, we discussed our ideas to create a book and Decorate With Flowers was born. 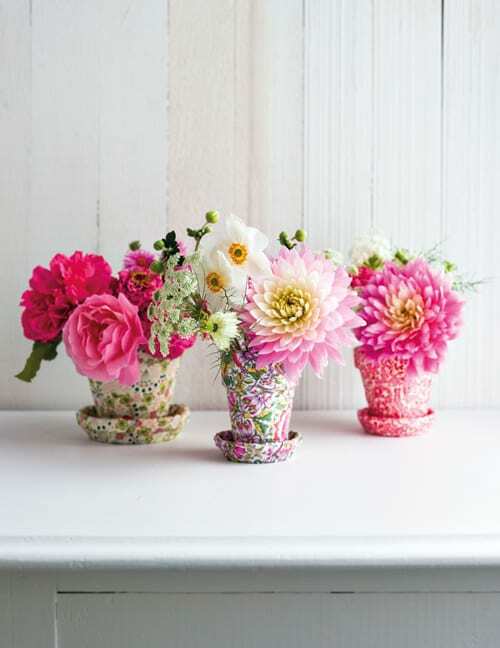 In the book, we marry our love of decorating with our passion for fresh flowers and crafting. And we want to reach those who are, like us, way too busy to create perfect arrangements and to instead, show a fresh approach to styling with flowers that makes floral arranging fun, affordable and quick! 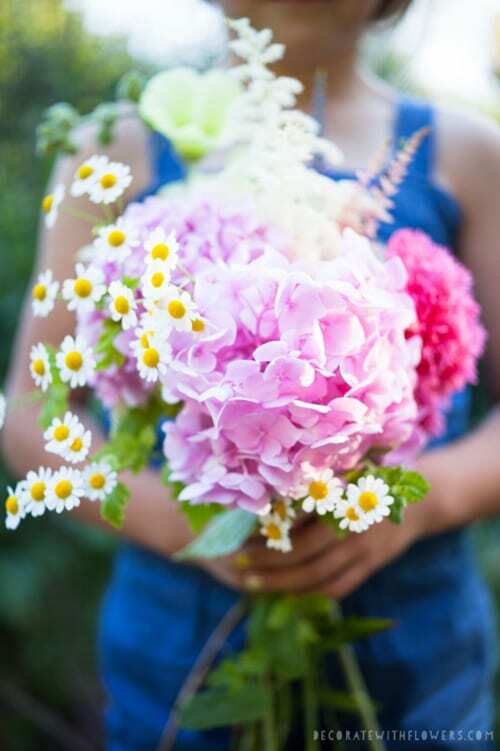 Have flowers always played an important part in your life? Yes, definitely. My mother was obsessed with flowers, gardening, plants and landscaping. We practically lived at Brookgreen Gardens growing up. She took me there constantly to observe the flowers and plants along with the wildlife… It was always such a peaceful and inspiring spot for me where we’d roam for hours. She was trained as a floral designer before I was born and continued making arrangements years later – she even did the flowers for my wedding! She loved working with fresh flowers, but also dabbled with high quality silks and she loved making flowers using crepe and tissue paper, too. She also loved to paint, so we had several oil paintings around the house of her floral still life works. When it comes to flowers as a motif, she used them on sofas, cushions, drapes, wallpaper and even her wardrobe reflected her love of flowers. How could this not influence a young girl?! In ‘Decorate with Flowers’, there are eight beautiful flower stories. Which one resonates most with you and why? I truly love them all, though if I had to choose I really loved Girly Glam and Market Style because Girly Glam was shot in LA and I loved the homes we feature and the DIY project. And I also connected to Market Style since it’s all about exploring outdoor city markets and we were able to inject some Liberty prints, so it’s very feminine and pretty. With Leslie being based in Canada and you being based in Germany, did you notice any particular differences in flower availability in each country, when you were writing the book? Not really, as both are northern climates and she had nearly the same flowers available as those I had access to with some exceptions of course…a few were native to northern Europe. The funny part was that I couldn’t always identify the flowers we used in Germany on our shoot days here because I only had the list in German and when translated, they weren’t always the same in US English and in UK English. And so figuring out the proper name for the correct language edition was a riot! As well as step-by-steps showing how to make arrangements, you’ve also featured customised containers. 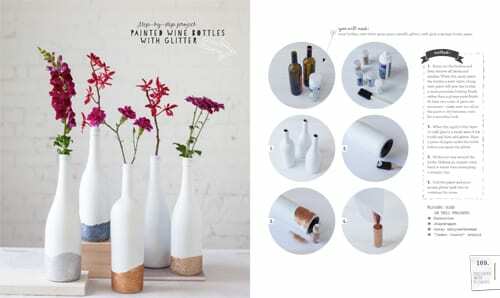 Where did you get inspiration for the container DIYs? The bottle chandelier is my very favourite design in the book (P60-61). Do you have an overall favourite? I loved that one too – we tested that in Hannover before Leslie made it in her studio and both agreed that it was a nice project and much easier than it appeared. The great thing is that you can use test tubes, mini vases, anything really and then play around with how you hang them, from length to the type of wire that you use – copper, silver, gold, colored, etc. 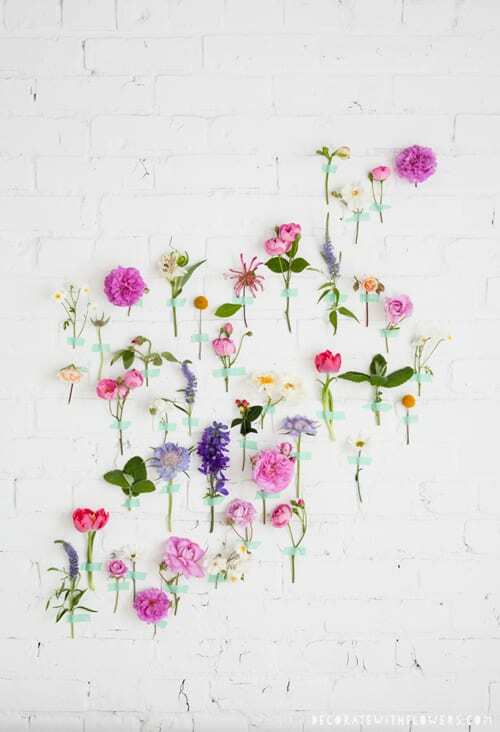 One design that I really liked is the flower wall cone (set of 3) that we show in the Market Style section. In Germany, when a child enters first grade, they receive a schultüte from their parents and most are handmade. Children are always photographed holding their schultüte and it’s a source of real pride here. It’s usually half the size of the child (not kidding!) and decorated in a creative way and filled with candy, toys school supplies, etc. and meant to give the child something to ease the anxiety of first day jitters. I thought the flower cones could be a mini version of those that you can use to decorate your walls, a wedding, etc. but instead, fill with flowers. Leslie and I brainstormed and the wall flower cones were born. The room or event I’m working on inspires the arrangements that I make. That is always my starting point – I pick the colors and flower type after surveying the space and consider what would work. 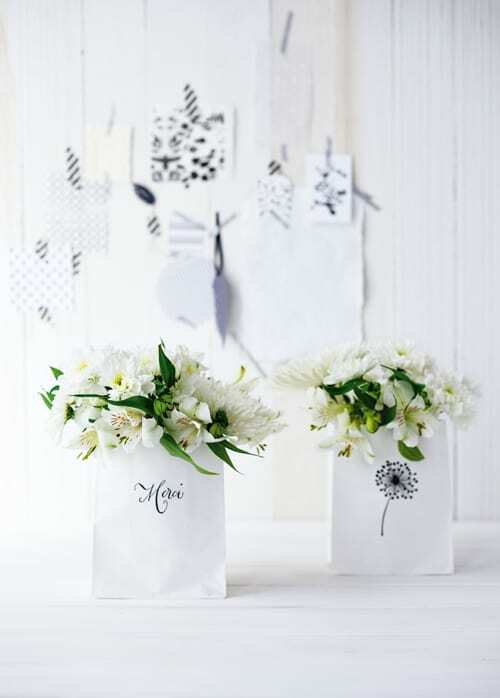 What are your top three tips for decorating your home with flowers? 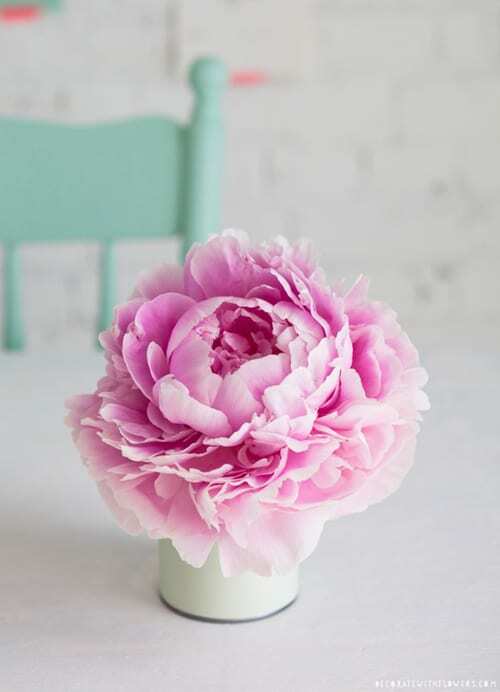 Do you have favourite flowers at certain times of the year? Yes, I love cherry blossom branches in the spring and later comes the peonies, poppies and sweet peas. And then towards autumn, the dahlias in their rich tones. In the winter, I love hyacinths on my windowsills and snow berries mixed with pine and white amaryllis. Bought or a gift? Bought, because I love to shop for flowers! Thank you SO much to Holly for all her help in compiling today’s blog post. Not only is she a best-selling author, but also a stylist, the founder/editor of decor8blog.com (a blog which I love!) and founder of decor8ecourses.com (many of which I’ve taken part in). If you’d like to hook up with Holly on social media, you can find her details below. I’m sure that ‘Decorate with Flowers‘, which is published by Jacqui Small, will be a huge success! Look out for my next blog post today that features an interview with Holly’s co-author, Leslie Shewring. Great interviews Rona, I really enjoyed reading Leslie and Holly’s comments about their new book. You’ve just provided me with yet another inspirational 10 minutes away from my work desk! Thank you.